I’m off out tonight, though you may already know that from the title. We’re having a talk on the Medallic Miscelleny of Nottinghamshire at the Numismatic Society tonight and I’m breaking the habit of a lifetime by attending. I’ve been a member in the past, several times, but so far I’ve resisted the temptation to actually attend. In principle I support the society, but in fact I’m not a very sociable person and have never been before. I can never raise the enthusiasm for leaving home on a winter night. There have been two meetings already this year and I have missed them both – one because we were away and one because it was the society auction, and I don’t buy coins. Next month it’s the White Rajahs of Sarawak, which isn’t quite so gripping. January is short talks by members and February is a talk by someone from the Framework Knitters’ Museum. They could be interesting and it’s time I opened my mind to new experiences so watch this space. March is Coins of the USA by the Boss, so I’ll remember who pays my wages and will be sitting there on the front row looking interesting (and employable). Apart from that, the electrician came and found that the electrical fault had corrected itself, we had one customer, several people rang up and I had cheese and pickle sandwiches for lunch. The pickle wasn’t very good. This entry was posted in Uncategorized and tagged electrician, Framework Knitting, Numismatic Society, talks, winter on November 12, 2018 by quercuscommunity. The Council doesn’t seem to have gritted last night, with the result that the roads are worse than they were during the last snow. Everyone knew it was coming, apart, it seems, from the man who arranges the gritting. This was the picture at 5.30 this morning. After a Saturday of snow flurries it finally started to settle overnight and was completely white by morning. We have four inches, which hardly qualifies as snow in some countries, but is big news in the UK, particularly in March. The TV weather report has just claimed six inches for Nottingham, so it may be worse in places. What I really want is some warm Spring weather and a few flower pictures. There are plenty of flowers coming out, but it always seems to be a grey day when I have a chance for photography. The outlook isn’t too bad, though I’m not sure how good it will be by the end of the day when I go to pick Julia up. The TV weather reports keep telling us where the snow will appear during the day, but is a bit short on information about when ours will melt. 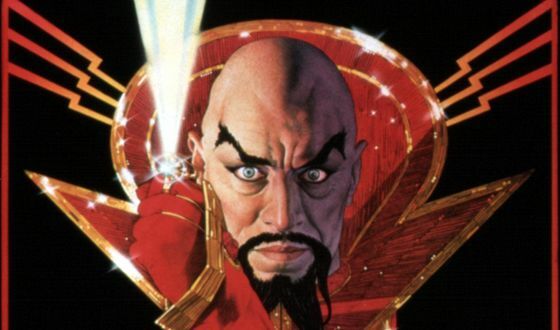 I’m beginning to see mental pictures of Vladimir Putin as Ming the Merciless in the film Flash Gordon. As I recall, it starts with an outbreak of bad weather caused by and evil, bald mega-villain. Normally I use my own photos, but I’m short of galactic supervillains so I’ve sourced one on the internet. I’m hoping that by giving a link to the film they will forgive me for lifting the photo. This is the “After” photo, taken in the light after I got home. Time to blog and eat breakfast now. This entry was posted in Uncategorized and tagged early mornings, snow, spring, thaw, weather, winter, work on March 18, 2018 by quercuscommunity. We had some snow today. That’s English snow – measured by the flake rather than the inch. After two attempts we have a very sparse scattering, which will no doubt freeze overnight and, as our street gets no sun in winter, stick about for a week or so causing problems. That’s how we deal with snow in England, acting surprised, being under-prepared and letting a few flakes close down the entire country. No doubt we will have train delays and car accidents tomorrow. I can’t help thinking that other places do it better. It’s unlikely, for instance, that Canadians or Scandinavians would even recognise this sprinkling as snow. Fortunately the urban population of the UK is plentifully provided with Chelsea Tractors. I will keep my opinion of such things to myself. It’s not that I’m short of opinions, but Julia has given me a list of jobs to do ready for her Open Day tomorrow. This entry was posted in Uncategorized and tagged Chelsea Tractor, poor preparation, snow, weather, winter on November 30, 2017 by quercuscommunity. I’ve always gauged the end of the year by the first serious frost, which always tends to flatten the nasturtiums. In my mind winter starts when the nasturtiums finish. The calendar may disagree, but that’s how I see it. They are actually doing quite well in the Mencap gardens at the moment. The nasturtiums are still looking reasonable, and there are quite a few stragglers in the beds. My original thought for a post was “The Last Geranium” but the photograph didn’t come out that well. As you can see, there is still a lot of colour in the garden, though it’s mainly just a few stragglers rather than beds of colour now. The sumac has mainly shed its leaves now, though the sedums are still showing well. The Elephant Grass (Miscanthus sinensis Zebrinus) is still looking good, with its stripes and fronds and the teasel, always looks good at this time of year. In fact there’s so much to show that I’ve just posted photos and I’ll let them speak for themselves. There were birds around too, plus a new art installation and piece falling off the camera – an interesting day all round, and material for a second post. This entry was posted in Gardening, Green Care and tagged elephant grass, garden colour, nasturtiums, sumac, surviving flowers, teasel, winter on November 3, 2017 by quercuscommunity.